Musicians, singers, artists of all sorts - watch this! This simple justification of artistic excellence as a form of protest is utterly brilliant. It puts my values into words so well. And these ideas apply to any institutionalized art, and especially art done by minority groups. I’ve had my issues with Marsalis in the past, for the important strands of jazz his approach excludes. But here, he is truly a unifier. Regardless of art form or ethnicity, let’s all make great art in these untruthful times. Last month, I did a long interview with Mimi Chan, on her ground-breaking ‘Culture Chat’ podcast. She was a fantastic interviewer, listened hard, and asked great questions. I am so often unsatisfied with how I sound on tape! It comes out cringeworthy, stuffy and ‘British’ to my ears. But listening back, this time I think I managed to articulate why I do what I do with some clarity and humor. It was actually funny in places. I hope you enjoy it! This was broadcast live on the uber-popular Elvis Duran show, on the morning of 9/11/2018. Max’s band were awesome - generous, efficient, open musicians, fun to work with. The song was so resonant about our city, and it was an honor to arrange the BVs collaboratively, and be part of this project. And this is why music is so, so important in the world. Quite something. Possibly the largest audience NYCGMC have ever connected with, with roughly 60,000 present in person in Central Park, plus 24 million via MSNBC. To blow my own trumpet briefly, my own TTBB arrangement, and I rehearsed the singers, with special choreography by Francis Toumbarakis, who did a great job! Oh, and Hugh Jackman is REALLY tall in the flesh! 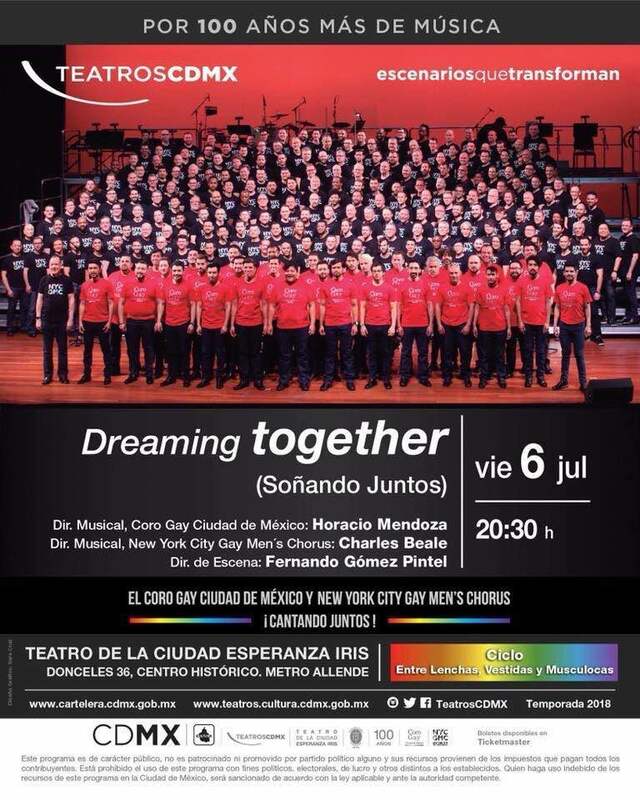 In late May 2018, I was honored to be given the chance to do a workshop with a very special group, Coro Gay Ciudad de México. I rehearsed them in some of their material for the up-coming show, did some jazz improvising with them because it was something different, and then we did a Vision and Mission workshop, which turned out to be especially impactful. At NYCGMC, our vision and mission has changed a bit over the years, but we know broadly who we are and why we do what we do. We experience the sense of community these groups can engender, we own that ours does that, and we tell each other that it does all the time. Likewise, we know that by our very existence, and through the songs we sing and the places we choose to express ourselves, we advocate for LGBTQ equality in the world. Steve Milloy and I are proud to announce that we are working on a third (Christmas) Popular Voiceworks book, due out in mid-2019. 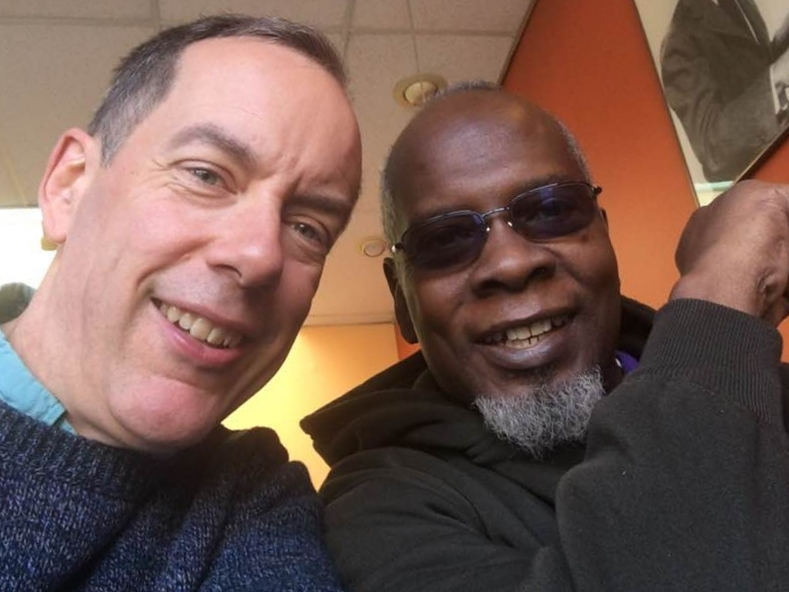 Here we are in a St Louis diner last November plotting and scheming for Book 3. I am so proud to be working with such an amazing writer. Ever since we first met at GALA event in 2003, we knew we would be writing partners, and we have also gigged together on odd occasions. Find out more about Books 1 and 2 and the amazing work Oxford is doing to develop choral singing through this series on the OUP website here. Stuart Perez is one of the bravest NYCGMC members I know. I met him for the first time in 2009, when he joined NYCGMC. We were preparing our show about crystal meth addiction, and I knew this had been an issue for him. At the time 1/3 of new HIV infections in New York CIty were coming from gay men using meth. He was generous enough to share his experience with me many times during the show's development, as I tried to get inside the world of meth. Key to our show, he was also brave enough to share with our singers during the show rehearsals, and with the audience during the show itself. 7 years on, I see this Facebook post today. I am so grateful for his kind words about me personally. As you can see from the photo below (used with permission), he is now thriving and our Chorus was clearly (and literally) a life-saver for him. You never know when singing can make a difference! We had a fantastic morning yesterday at the Voice Charter School in Long Island City in Queens, working with around 100 6th-8th Grade students. Under the leadership of my hugely talented colleague and partner-in-crime, Johnny Atorino, NYCGMC members initially joined the students in their morning Advisory sessions, and chatted in small groups. We then performed to them collectively for 40 minutes or so. Our carefully chosen program was interspersed with personal stories told by NYCGMC members about their experiences in school as LGBTQ youngsters. We finished with a song that we all sang together, Sia's amazing 'Bird Set Free'. Our boys sang their hearts out, the children were highly involved and respectful, and one of their teachers described the students as the most engaged they had seen them at any assembly this year. All laughed, and some of the children were also visibly moved, even tearful, as a result of the stories they heard. Some of our members were also deeply moved by the attentiveness and acceptance of the students as they made themselves vulnerable. We came away feeling that we really had made an impact, and that the interaction had been a win-win and a genuine connection moment for both groups. That's what we do. What we offer as an organization is a very deep understanding of the impact of singing on people's lives. This is clearly a fertile way forward for music education, as well as education about LGBTQ people. More to follow as we put together a more extensive program for 2017-18, and get donors and funders involved. Watch this space! i am proud to announce that the new Oxford Handbook of Choral Pedagogy has just been published, and in it my chapter on LGBTQ choral singing, entitled: "A different kind of goose bump": Notes towards an LGBTQ Choral Pedagogy. My hope is that through this book, choral directing students will discover LGBTQ choral singing as a unique and vibrant area of study. Perhaps this research wil also inspire them to get involved, help them personally and bring new talent to LGBTQ ensembles across the world. So what is this chapter about? It looks at the extent to which we can define LGBTQ choral singing as a unique area of study, with its own pedagogy. While mainstream choral pedagogy has a vital role in LGBTQ choral singing, my analysis of singer interviews and a literature review suggests that LGBTQ choral pedagogy is in other ways unique. Indeed, directors of LGBTQ choirs and choruses are ahead of the game in key areas. First, the relationship between gender role and voice part should be loosened, so that everyone on the gender spectrum can sing the part that best suits their voice and gender identity. Why should a soprano or alto be necessarily female? Or a baritone necessarily male? History reveals this strict binary has not always been the case. LGBTQ practice proves that flexible approaches to gender can have significant advantages, both for singers and for the sound choirs make. Many of us are capable of safely making a wider range of pitch and resonance than conventional gender roles and concepts of vocal 'success' enable us to use. Second, the transgender changing voice is a complex and under-researched area, where those of us managing LGBTQ choruses have developed an entirely new area of vocal pedagogy. The issues experienced by singers in MtF and FtM transitions are very different from each other, and vary hugely from person to person, depending on the nature of their vocal mechanism, their age, their initial gender identity and their previous vocal use. Such singers have separate and unique needs, and should be taught differently. While existing work on the changing voice of the teenage boy (and girl) is useful, it by no means covers the effect of hormones on the adult voice, or the issues experienced by MtF transition. in LGBTQ choruses, we also make repertoire choices that function uniquely. 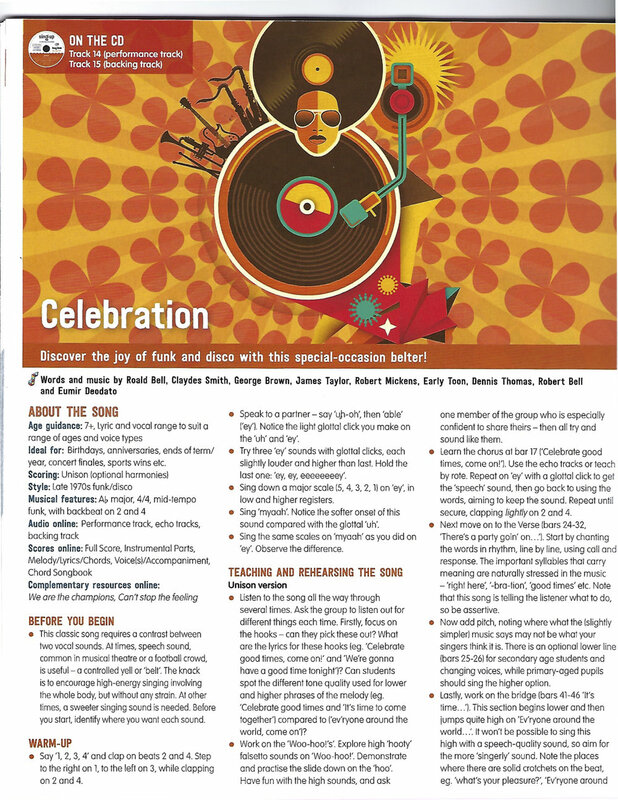 Our choices tend to focus more on the needs and aspirations of LGBTQ singers and other minorities. The program choices we make tell different stories, and connect communities in ways that inspire new singers to take part, facilitate new access and attract new audiences to see choral singing. 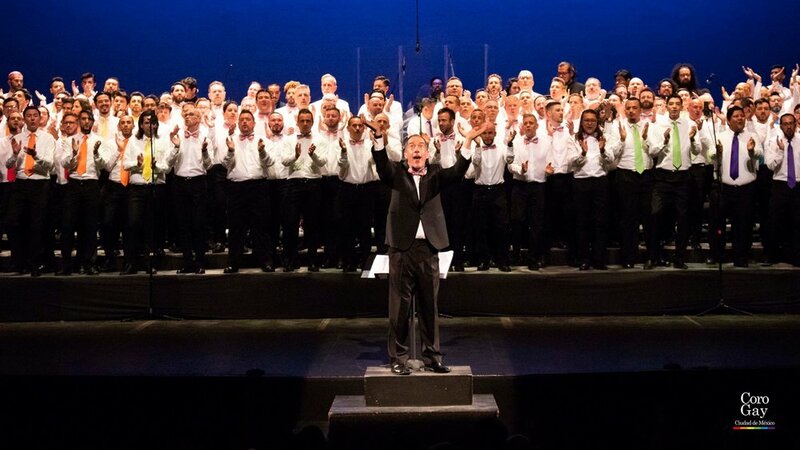 The styles LGBTQ choirs program are often more varied,because their purpose is different. This influences the way in which we audition and teach our groups, our definitions of vocal success, and the kinds of vocal resonance we seek from our singers. In our groups, choral singing functions in unique ways, creating new and more contemporary kinds of goosebump. I conclude by suggesting that college programs should change, so that all choral directors get training in these unique areas. Our goal should be that in all secular and religious choral contexts, LGBTQ singers are enabled to sing as safely and enjoyably as their straight(er) counterparts. For more about the new Oxford Handbook, see the Oxford University Press website here. And you can get a copy of the book here. A fascinating day at OutSummit, thinking about international LGBTIQ activism in the new reality of global populism.